Yesterday, I found a beautiful Luna Moth under the oak tree in the back yard. It was dying. I couldn't just let it lay there on the rain-soaked ground so I carefully picked it up and laid it in a flower pot filled with mint and orange daisies. I did take some pictures of her and put one of them here. Early this morning, I saw that it was still there but lying on it's back. It had died during the night. When I went out later to get a closer look, I saw that a bird must have come along and made a meal of it because all that was left were its wings. So is the cycle of life. 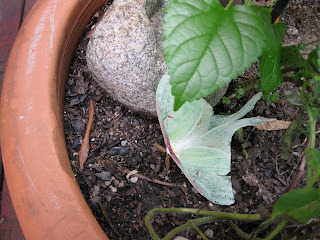 I gathered up one of the wings and took inside to keep as a remembrance of the lovely, delicate moth. I hope she got a chance to lay her eggs before she lost her life. I am grateful that I had a chance to see her and perhaps make her last hours on the Earth a little easier.